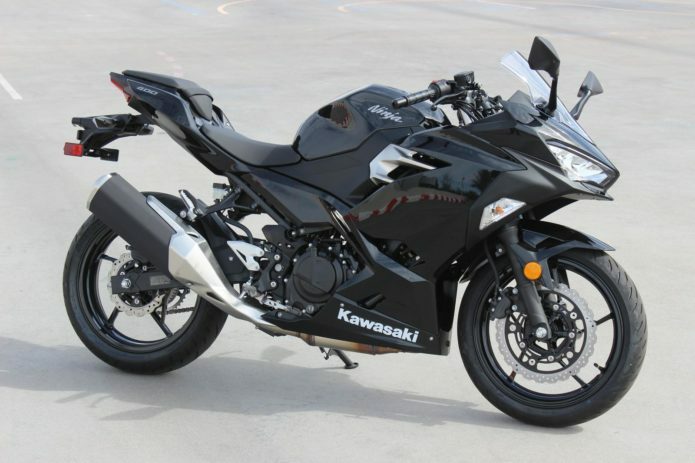 In case you haven’t figured it out by now, we – err, at least I – really love the Kawasaki Ninja 400. Ryan came off the bike at its press intro and was happy as could be. He’s such a fan that he pointed out the 10 things he specifically likes about it. Then, once we stacked it up against the KTM RC390 and Honda CBR500R in our 2018 Lightweight Sportbike Shootout, the Ninja 400 came away a winner, yet again. As far as lightweight sportbikes go, this one is sweet. It’s a great entry-level motorcycle for the new or returning rider, but has plenty of performance for the experienced rider to exploit. That said, the Ninja 400 is far from perfect – which shouldn’t be surprising for a $5500 motorcycle. Now that we’ve spent a considerable amount of time with the Kawasaki, we have a pretty good idea of things needing some attention. Here are eight things I’d change on the Kawasaki Ninja 400. For some strange reason, the bars on the Ninja 400 are angled inward toward the rider quite a bit. We’re not sure why as, even at full lock, there’s plenty of space between the bars and the bodywork. When you’re riding, it almost feels like you’re doing the chicken dance with how close your arms are to your body. Okay, maybe that’s a bit of exaggeration, but bolting on a set of aftermarket bars and opening up the angle would be high on my list of changes to the bike. Ryan pointed this out during his First Ride of the bike, and it’s also one of the first things we noticed about the 400 during the Lightweight Sportbike Shootout – there’s not much room to move about in the saddle. Unfortunately, the subframe looks to be welded to the motorcycle instead of bolted on, meaning modifying it would still be possible, but irreversible. If carrying a passenger or luggage was a priority, then I’d extend the subframe even further. If solo riding were a higher priority, I’d find a way to revise the bodywork to give the pilot more seat room. Either way, there would be some extensive modifications needed to have some space to scoot back without knees touching elbows. One of the first things anybody does to their motorcycle is change the exhaust, and the Ninja 400 is no different. While I’m not particularly a fan of the sound coming from parallel-Twins (Yamaha MT-07 excluded), I am a fan of opening up a motorcycle’s airways and letting it breathe. As a performance-oriented guy, the extra power and reduced weight an aftermarket exhaust brings is a nice benefit. Of course, simply adding an aftermarket exhaust is only part of the solution. Making sure the engine receives the proper air/fuel ratio to accommodate the new exhaust is also key to a properly running engine. With the Ninja 400 in particular, the engine will spin up to 12k rpm, but seems to hit a flat spot once it approaches those engine speeds. I’d imagine a few clicks on a computer with some clever re-mapping would waken the 399cc screamer all the way to redline. One of the easiest ways for manufacturers to bring the cost of a motorcycle down is to equip it with basic suspension. Unfortunately, the Ninja 400 is not immune to these tactics. That said, the standard suspension on the baby Ninja is quite good considering how bare bones it is. But if there’s room for improvement, it would definitely be here. If this were primarily a street bike, the biggest change I’d make is to soften the high-speed compression – the Ninja’s stock dampers have a hard time dealing with stutter bumps on the roads, transmitting a lot of those jolts to the rider. For a track machine, I’d make everything fully adjustable. Apart from having a cramped seating quarters, the pegs are also fairly close, creating a relatively tight seat-to-peg ratio. In all honesty there are much more uncomfortable motorcycles, but since the majority of Ninja 400 owners will likely never bring their bike to the track having pegs that high doesn’t make much sense. With a set of lower pegs and more space to move in the saddle, the Kawasaki could pull off some light-duty touring. Maybe I’m spoiled, but once you ride motorcycles with quickshifters you never want to go back. One of the easiest, most cost-effective modifications you can make to nearly any motorcycle is to equip it with steel-braided brake lines (if it doesn’t already come with some from the factory). The little Ninja is another motorcycle needing of the modification. To be fair, the standard brakes are actually quite good – rubber lines and all. But they could be better. That’s where steel lines come in. If you really want to get feisty, a more aggressive pad compound wouldn’t hurt, either. With these eight changes the Ninja 400 would be transformed. It may not win many drag races, but it would be the bike that could nearly do it all, especially impressive considering its displacement category.